Bar chart showing the golfers with the most wins in the early GP season. Bar chart showing the golfers with the most wins in the mid GP season. Bar chart showing the golfers with the most wins in the late GP season. Bar chart showing the golfers with the most wins overall. Bar chart showing the golfers with the most top tens in the early GP season. Bar chart showing the golfers with the most top tens in the mid GP season. Bar chart showing the golfers with the most top tens in the late GP season. Bar chart showing the golfers with the most top tens overall. Bar chart showing the golfers with the least missed cuts in the early GP season. Bar chart showing the golfers with the least missed cuts in the mid GP season. Bar chart showing the golfers with the least missed cuts in the late GP season. Bar chart showing the golfers with the least missed cuts overall. I have renamed the "Best in Segment" chart link to "Best Average Result". I have removed the "Best Overall" chart link when early/mid/late season is selected from the drop down list. 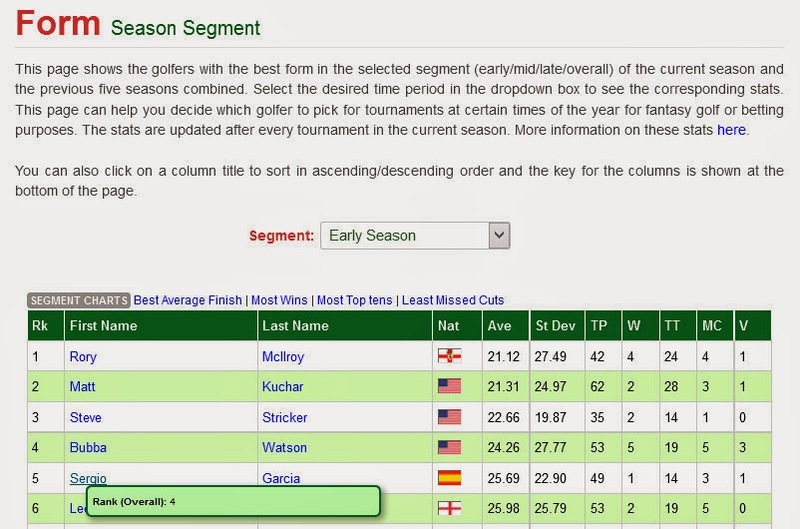 It is still available as the "Best Average Result" when overall season is selected from the drop down list. This seemed the most logical thing to do in light of these new charts. I have changed the chart heading label from "Charts" to "Segment Charts". I have fixed a few minor errors with the original functionality, such as incorrect case on some words in the chart introductions. I have handled the case where all golfers have zero values for a chart. This actually happens for the least missed cut chart (late season), where interestingly a large number of golfers haven't missed a cut at all at that time of the season. 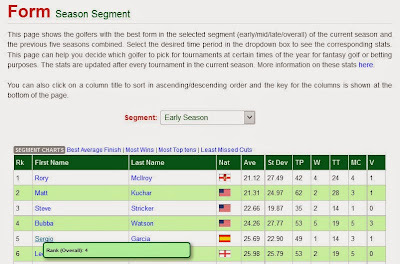 In this case, no chart is displayed but the list of golfers is displayed with the hovertext (containing number of tournaments played, their rank for that segment and the zero value). This has to be done because there is no hovertext available on the charts for zero values. Similarly, if there are any zero values in charts where some golfers are non-zero, the zero value golfers will be listed under the chart. These new charts bring the total number on the site to 369. Similar to before, non-subscribers will not be able to view the new charts listed above. Therefore, sign up today to get the most out of Golf Predictor, the premier European and US PGA Tour statistics site.